Our staff of experts has been serving the restaurant industry for decades. We're here to help, so contact us if we can assist you. 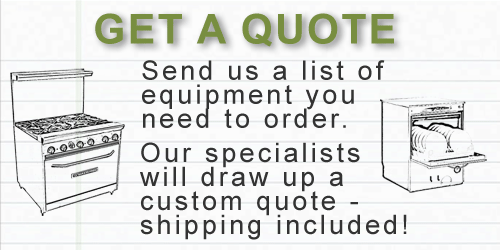 We have stocked equipment in several locations throughout the USA. Track Your Order Online using your order number. You will also receive an email when your order ships with a tracking number for FedEx, UPS, and most trucking shipments. For questions about existing orders, use the Order Inquiries Form. Answers to many questions can be found in our Frequently Asked Questions.